Putting his record in the spotlight. He details the specific incident and explains this as his motivation to seek office. David is facing Democratic candidate, state Rep. Madeleine Dean for the newly drawn 4th District open seat in parts of Montgomery and Berks County. The Dean campaign did not have a comment on this ad. 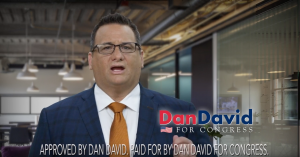 This is the first television ad of the race between David and Dean. If the people of Montgomery county want to pay all of their hard earned money back to the government in taxes, then they can vote for Dean. If they want to have their money in their own hands to make the purchases they want for their own family and actually own their lives, they will vote for Dan David. Pretty bipartisan guy who seems to be focused on what Americans care about most, their own wallets. He’s by far a better choice than Dean. Well, he is helping to stimulate the economy with the ad. Why did he use a furniture store for a background????? How did I get stuck with this putz? Yawn. He has a first-name for a last-name. Thereby, I do not trust him. Vote Mad Dean for Congress. She may have a first-name for a last-name to but at least its the opposite gender! The green screen and stock footage almost makes you not notice how bad his suit is. Republican voters have the incompetent Montco Republican Committee to thank for this clown. Then he should really be peeved at his own party for passing that Tax bill that only benefits the wealthiest of Americans…or the GOP’s incessant longing to do away with SS, Medicare, Medicaid, Obamacare….